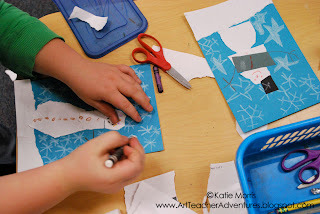 Last year I saw a post on Art Makes Kids Smart about using "GOOSe paper"- Good On One Side in Art projects. I thought this was brilliant and a way to make reusing fun so students don't feel like they are using trash. 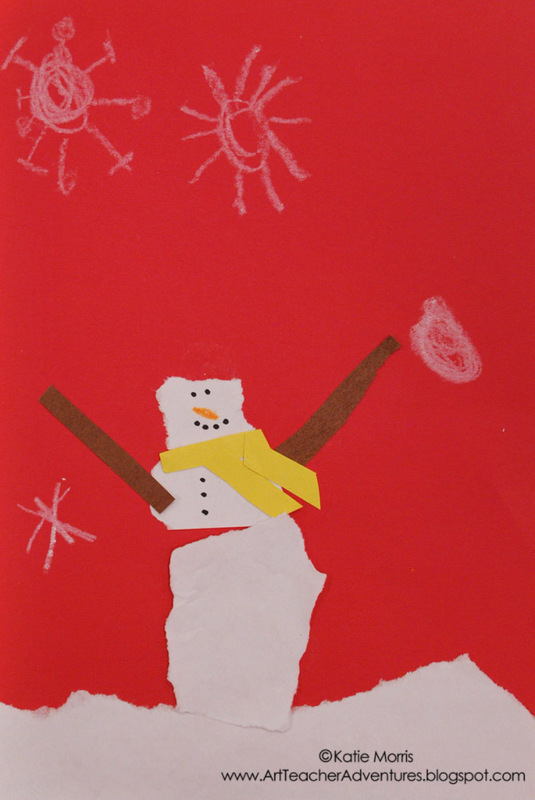 I used the idea with 1st grade students to make torn paper snow people. I'm pretty sure this was a two class period project. 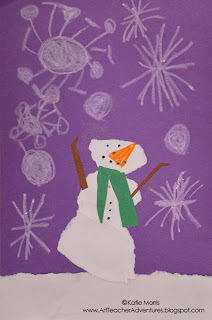 The students used 9x6 inch colored construction paper for the background, tore GOOSe paper for the snowy ground, then used more GOOSe paper for the body of the snowperson and construction paper scraps for the accessories. We finished it off with crayon details. Glue sticks worked great and I really liked the personality in the students' work. 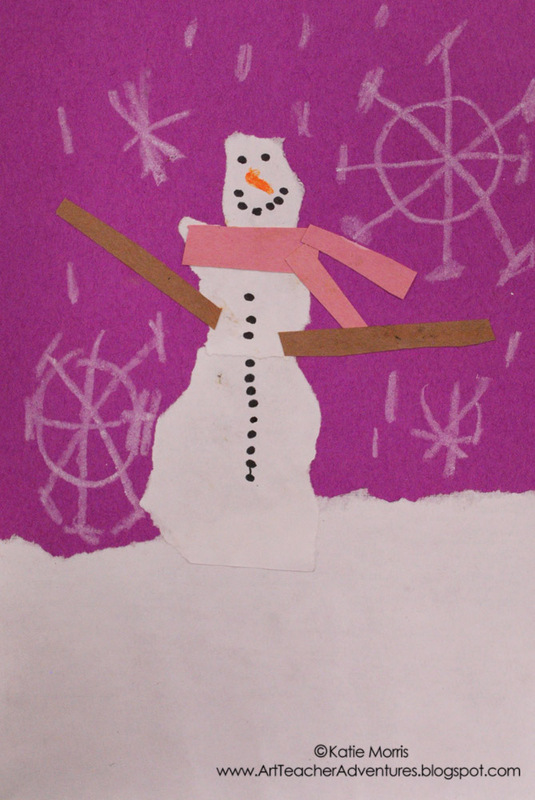 I must have let the students use scissors to create the accessories but there was a no scissor rule for the first day with the snow. NOOOOOOooooooo ... not ready for snow yet!!!!!!! But anyhow, the snowmen are adorable, and I also loved the GOOSe idea when it was posted last year, so much so that I made a sign about it in my art room. 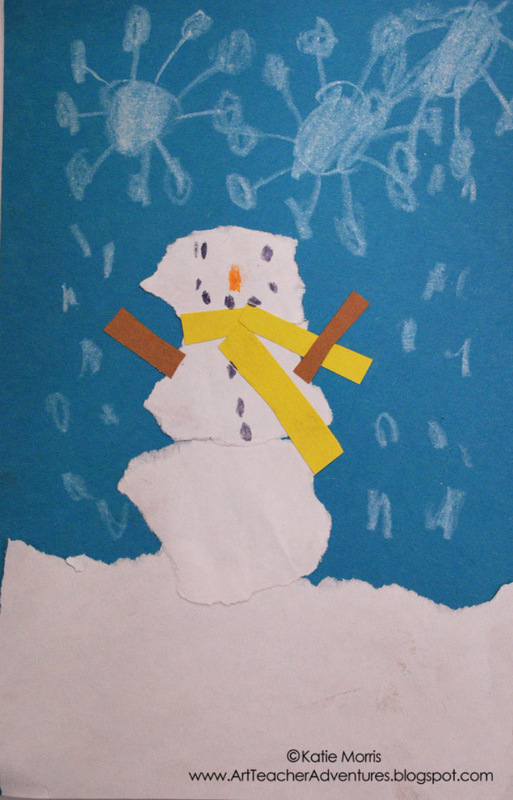 Snow is coming soon - maybe some flurries tonight here I hear. I'm not ready for snow yet either! I am your newest follower and was hoping that you would stop by my blog and follow me back! Nice piece of art. I wonder If I can do it also even I'm already old enough. YEAH! Snow project already!! I am pumped. I updated my liquid watercolor post to answer your question. It was a good one, and something I forgot to mention. Go check it out!